Mellow | The Electric Drive that fits under any Skateboard – Mellow Boards GmbH | Are electric skateboards legal? No matter where you ride, hours of research can be summarized in an answer starting with "No, but..."and in one rare instance (California) "Yes". 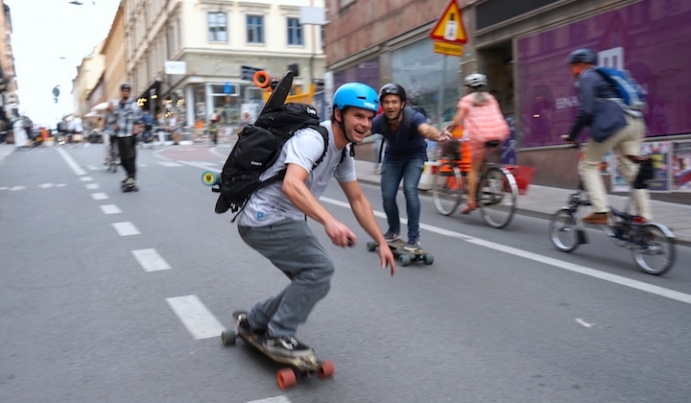 Despite this, the electric board sector is growing fast, board makers are multiplying, and powered skateboards can be seen in use in cities all over the world. To understand the long answer that usually follows the "but...", keep one thing in mind: electric skateboards are new. Some countries like Australia are making progress giving e-skaters rights to roll since they are considered as "wheeled recreational devices." Unlike cyclists, skateboarders are classed as pedestrians. This means you cannot ride your electric skateboard on roads with median strips, one-way roads with more than one marked lane or any road where the speed limit is greater than 50 kilometres per hour. Singapore is another progressive nation including e-skates in laws that allows them to roll on a footpath up to 15km/h and 25km/h on cycle paths but technically illegal on the road. The Michigan House just passed an electric skateboard legislation. If finally approved by the senate it would allow electric skateboards to go no faster than 25 miles per hours on the same surfaces as bikes and cars. The good news for people living in Sweden is that e-skates have recently been assimilated as bikes and given them the same rights with a few speed limitations. Similar in Belgium where light electric vehicles are legal to ride under the SEGWAY laws. They are treated like a bike as long as they don’t go faster than 25 km/h. Norway also just legalized light electric vehicles considering them the same as bicycles. Norwegians don’t need an insurance, registration or admission to ride. Permitted maximum speed is 20 km/h, you need head and tail lights, reflectors, a certain braking power and a signal horn or signal bell. However, exceptions to these requirements may be granted where such equipment can not be fitted. - Light electric vehicles with max 1 kW power and max 15 km/h top speed are seen like pedestrians, no need for insurance or registration. - Vehicles with max 1 kW power and max 25 km/h top speed, can be used like bicycles, only lights, reflectors and a horn is needed. No need for insurance or registration. - Vehicles with more than 1 kWpower and over 25 km/h should be registered as a moped with type approval and motor insurance. A country in which things seem to get moving in 2018 is Denmark. The Danish Parliament announced a test period for the adoption of a law for light electric vehicles allowing e-skates in traffic. Germany is also working on a draft regulation for the approval of light electric vehicles, but this will only include vehicles with a handle, so mainly scooters. A regulation for those with a maximum speed of at least 12 km/h up to a maximum of 20 km/h is scheduled to become effective in 2018. Most countries and localities haven't yet seen the need to enact a motorized board law or don't even know what e-skates are. Even California's unique and visionary law has enough caveats to show they are out of step with current e-skate technology. We predict that the greater need for cleaner and less congested cities will accelerate and evolve the attitudes of our lawmakers and law enforcers. E-riders, as pioneers of this sustainable future, musn't be discouraged and should merely educate themselves before riding - this simple act will contribute to bringing change. Californian law AB-604 defines an 'electrically motorized board' as "any wheeled device that...has an electric propulsion system averaging less than 1,000 watts, the maximum speed of which...is no more than 20 miles per hour." Whereas the two most well-known Californian electric skateboard manufacturers advertise top speeds of 22 mph, and the Mellow Drive itself will reach speeds of over 24 mph. Electronic skateboarding is indeed legal now in California, but not as many would like to practice it. The absence of a specific 'electric skateboard law' does NOT mean that electric skateboarding is legal. Whether it be New York, Berlin or London, the self-propelled, non-human powered aspect of since e-skates clasify them as "motor vehicle", and therefore potentially usable on roadways and in traffic. Unfortunately, laws require any motor vehicle to be registered and insured, and requests for these will simply make your local vehicle authority or insurance company chuckle. If you've just emptied your Mellow webstore basket, read on: both the e-bike and Segway were originally illegal for exactly the same reasons described above. Nevertheless, more widespread use and successful lobbying helped bring acceptance and tolerance with law enforcement, wiht the solutions they offered capturing the attention of lawmakers. The majority of permissive new laws for e-bikes have sprung up worldwide in only the last 3 to 4 years, with some countries even adopting others' standards. Segways in Germany now sport little license plates, and enjoy permissive regulations in most American states. As recently as 10 March 2017, the German parliament voted to legalize e-bikes by inclusion into the same classification as Pedelecs and conventional bicycles. Today, as high-performance sporting equipment, the Mellow Drive is completely legal to use in Germany and other countries on private property. For tomorrow, we see a future where e-skaters can enjoy responsible use anywhere.